I admit this is not my favorite recipe so far in our project. I tasted only a few bites and then ate leftover soup for dinner. Jim took primary responsibility for developing and executing this recipe with an authentic Glen-Mor restaurant result. Heat a large non-stick skillet over medium heat. Add the bacon in single strips and cook until crispy. Remove from skillet and set aside on paper towels. Drain and reserve the bacon fat, do not rinse the skillet. Sprinkle salt on the liver. Place flour in a shallow bowl. Dredge the liver in the flour to coat evenly. Return 2 Tbsp. of reserve bacon fat to the skillet and heat over medium heat. Add the liver and cook two minutes on each side. 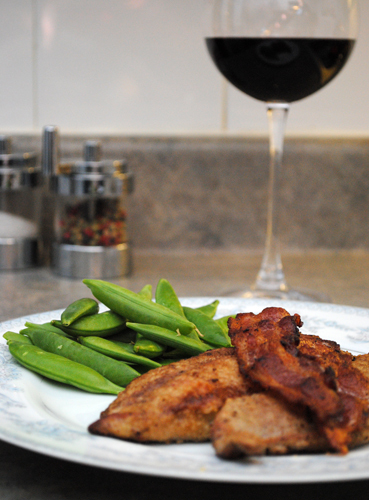 Serve liver with bacon strips on top.